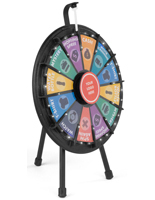 Looking for a way to add excitement to standard business or classroom functions? 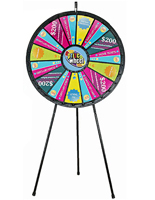 These high quality custom prize wheels are a great way to incorporate an element of fun into a wide variety of events. 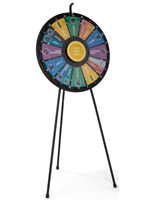 This type of tabletop or floor standing attraction features a slotted disk that holds user-printed graphic inserts. 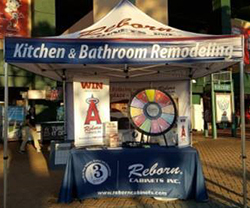 When taking a promotional spinner to a new event, panels can be updated to tailor to that specific occasion. 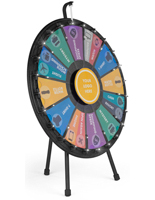 These custom prize wheels with plastic clickers bolster customer and employee interaction with the possibility of winning. By giving them a chance to play, contestants get involved in the game and more familiar with the company hosting it. 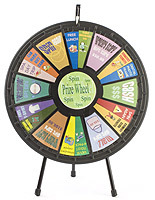 This investment also makes these custom prize wheels, or spin-to-win boards, a popular choice for schools that are looking for ways to make learning fun. These fixtures can also be used in many other environments thanks to their adaptable attributes and countertop size. 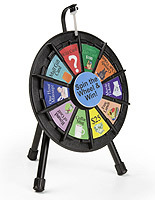 What are some common features that these spinning promotional games share? 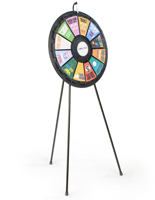 Many of these custom prize wheels are crafted from a combination of highly durable ABS and PETG plastic. This hard-wearing material will help fixtures last throughout years of usage. 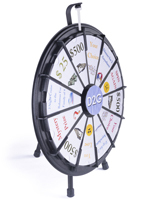 Each stand has an aluminum, steel or MDF fabrication that can hold up to a great deal of use. Most bases can also fold to some degree, shrinking them down when it comes time to store or transport the attractions. With their small size and light weight, these stands are highly portable. 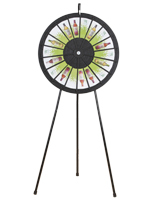 Spin-to-win prize wheels like these can easily be taken to any demonstration or exhibition. Updating the slotted boards is easy with a number of pre-cut channels and a magnetic central panel. Simply insert a paper cut-out into each of the plastic holders and the center plate for personalization. 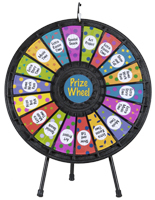 Prize wheels like these are ideal for any store, school or business. Each spinner has a unique design with different options for any user. The number of slots ranges from (10) to (30) for accommodating any user. Some models have a design that allows them to have a varying number of channels, such as (12) to (24) or (15) to (30). This means that the number of inserts can be changed on the fly between different venues. For easy customization, most of these units include templates with their purchase. These patterns make it easy to create personalized designs that reflect what gifts and awards are being given out. Simply print them out on a home or office printer and easily slide them right into the slotted display. No special paper is required for these inserts. 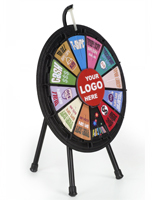 Portability and adaptability are two other important features of these promotional wheels. Some designs can be converted from a countertop to a free-standing display and vice versa. These folding and collapsible legs also make transporting and carrying the wheels a simple task. With their collapsible design, these fixtures are easy to store and transport to different events. 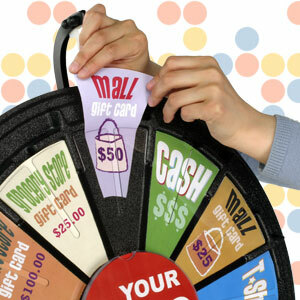 Where can these slotted promotional tools be found? Businesses like to set the stands up during company parties as a way to show employee appreciation. Giving workers a chance to win prizes when they've made notable accomplishments boosts morale and gets them more involved in the workplace. 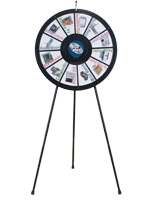 They can also be used as a part of contests running at trade show booths and in retail stores, giving customers a chance to spin for a prize after they've filled out a survey or made a purchase. They are also effective in classrooms as a great way to make learning fun and engage students in a topic they may not be interested in. 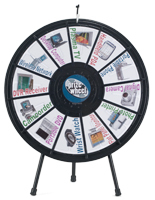 Spinners like these are also ideal for games when reviewing materials before a test or quiz.